August, 2011 | H&R Group K.K. They say Utsumi Beach has the finest sand in the world, but probably only the Japanese say that. It is a great beach though, is well known throughout the Tokai region for its beauty. Its 1.6km length is a nice bow shape, and you can rent parasols and buy beer, drinks, and food just off the sand. I have been a few times when DJs were playing, and there was no shortage of people enjoying the music. The beach is crowded, but well worth the trip. What are you doing this weekend?? August is the best time to visit this beach, and people flock to see the fireworks and other events that are held at that time; beware though! September is Jelly Fish season! You do NOT want to get stung! By Train – Meitetsu Chita Shinsen Line from either Nagoya Station or Kanayama – about 1 hour. It is a 20 minute walk from Utsumi Station to the beach. A taxi will cost less than 1000 yen. By Car 7 minutes by car from Minamichita IC on the Chita Peninsula Expressway. Kiso Three Rivers Park in Ichinomiya was an old favorite of mine when I used to live in Konan City. I am not sure if the whole complex counts as being part of the park, but there were spots to play sports, and all kinds of things to do there. The 138 Park Tower has some nice views, and the surrounding flower garden is a great place to walk. The name ‘Ichino-mi-ya’ can be read as the number ‘138’ in Japanese. You might not know this about the Japanese people, but they love that kind of thing, and so the number pops up regularly locally. 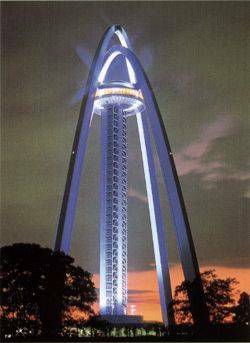 The Ichinomiya Twin Arch 138 is the tallest arch-style tower in Asia at 138m. The tower sports and observation deck at 100 meters with a 360-degree view of the Nobi Plain, including the course of the Kiso River. You can also see the peaks of the Japan Alps, Ise Bay, and if you look carefully, Nagoya Station’s JR Central Towers in the distance. There is what is described as an “elegant buffet,” but I remember more as a kind of cafeteria up there, and I actually did enjoy drinking my coffee in it. Great view; much different than my usual view from some Starbucks or another in Nagoya. Interesting sites: a village constructed entirely on an island in the Kiso River, and a description of a battle that occurred in the area back in the way back days. The surrounding area is largely parkland, and the garden is especially nice to visit during Cherry Blossom Season (!). Spring and summer are a pleasant time to visit the Rose Stream, a garden comprised of more than 4000 roses. It is a nice place to stroll, with half the walk passing through the flowers and trees, including many decorative plants cut into animal shapes, and the other half along the river side. There are many places to sit, and at certain times of year the whole area is lit up in “illumination,” or what I refer to as Christmas lights. Why not take a trip out to Ichinomiya this weekend and hang out at Kiso Three Rivers Park? The park grounds are free to wanderer! To go up Ichinomiya Twin Arch 138 it is 500 yen for adults (15+) 500yen, kids (6 -14) 200yen , Preschoolers (4 – 5) 100yen, and 65 or older 250yen. On certain days you can climb the staircase for 100 yen. The park is closed the 2nd Monday of each month except for August and December. 21-3, Aza Urazaki, Oaza Komyoji, Ichinomiya C. Aichi Pref. From Meitetsu Ichinomiya Sta. on the Meitetsu Line or Owari-Ichinomiya Sta. on the JR Line take the Meitetsu bus bound for Sango Nishi. Get off at the Komyoji stop, which takes about 20 minutes. From there it is a 5-min. walk. Take the Ichnomiya-Kisogawa exit on the Meishin Expressway and drive northbound on route 22 for approximately 20 minutes. Look for the tower eh?